The 2015 Catholic Services Appeal (CSA) surpassed its $3.25 million goal in record time this year. By Jan. 15, the total amount pledged reached $3,466,729. Since that time, an additional $135,519 has been collected — bringing the appeal to 111 percent of its original goal. The success of the campaign is thanks in no small part to the pastors and parish leaders who regularly provide testament to the importance of the appeal, said Richard “Tink” Guthrie, director of the Archdiocese of Louisville’s Office of Mission Advancement. “The primary driving force is the pastors, who convey the message in heartfelt and meaningful ways to their communities,” he said in a recent interview at the Chancery. The appeal funds dozens of ministries and programs of a wide variety throughout the 24 counties of the Archdiocese of Louisville, such as seminarian education, Catholic Charities outreach programs and training for lay ecclesial ministers. Seventy-five percent of parishes in the archdiocese (83 out of 110) have met their goals this year. Only 56 parishes achieved or surpassed their goals last year. Nine other parishes this year have reached between 95 and 99 percent of goal. Of particular note, Guthrie said, is the number of donors who participated this year. As of last month, 14,327 people gave to the appeal, a small increase over last year’s 14,245. The increase is, in fact, significant, said Guthrie. In recent years, here in the archdiocese and nationally, total contributions have risen, but the number of donors has been trending downward, he said. An uptick in the number of donors “speaks volumes,” he said. “The unprecedented success of the campaign, both in terms of dollars raised and the increase in the number of donors reflects greatly on the momentum, the energy of the archdiocese,” Guthrie said. St. James Church in Elizabethtown, Ky., had 454 contributors — one of the highest numbers. The Hardin County parish also blew away its initial goal of $109,500, raising $149,363 — 136 percent of its goal. The parish contributed the most of any parish outside Jefferson County and had the second highest contribution in the archdiocese. Holy Trinity Church in Louisville had the highest collection at $253,812. Father Martin Linebach, pastor of St. James, in addition to St. Ambrose Church in Cecilia, Ky., and St. Ignatius Church in White Mills, Ky., credited the success of the parish’s collection to the parishioners. “At the end of the day, if people clearly understand the need, they respond,” he said. 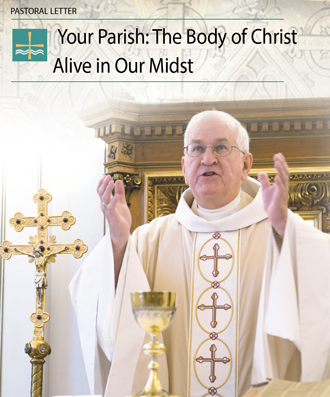 In order to understand that need, Father Linebach said, he and parish staff made a concerted effort to provide consistent communication, repeating one message. Father Linebach said St. James also invited Tony Cecil, a seminarian for the archdiocese and a son of St. James, to speak on how the CSA affects his life. Funds from the CSA support the education of future priests. Providing a “face to the funds” made an impact, Father Linebach said. Under Father Linebach’s leadership, St. Ambrose and St. Ignatius parishes also exceeded their respective goals. St. Ambrose blew away its initial goal, raising $8,045, which is 130 percent of its original $6,200 goal. And, St. Ignatius parishioners donated $9,035, representing 124 percent of its original $7,300 goal. St. Francis of Assisi Church with 178 percent. St. John Vianney Church with 174 percent. St. Elizabeth of Hungary Church with 138 percent. Good Shepherd Church in Columbia, Ky., with 161 percent. St. Christopher Church in Radcliff, Ky., with 143 percent. Holy Trinity Church with $253,812. The Cathedral of the Assumption with $131,029. St. James in Elizabethtown, $149,479. Basilica of St. Joseph Proto-Cathedral in Bardstown, Ky., $117,711. St. Aloysius Church in Pewee Valley, Ky., $79,515. This year the archdiocese also introduced the Salt & Light Giving Society for those who make donations of at least $500. Calling it a tremendous success, Guthrie noted that 1,639 individuals gave at this level or higher. Within the society are incremental recognition levels: the Circle of Faith level for those giving $500-$999; the Circle of Hope encompasses those donors who pledge $1,000-$2,499; the Circle of Charity for gifts between $2,500-$4,999; the Disciple Circle are for gifts between $5,000 and $9,999; the Steward Circle is for those giving $10,000 to $19,999; and the Shepherd Circle is for gifts of $20,000 or more.